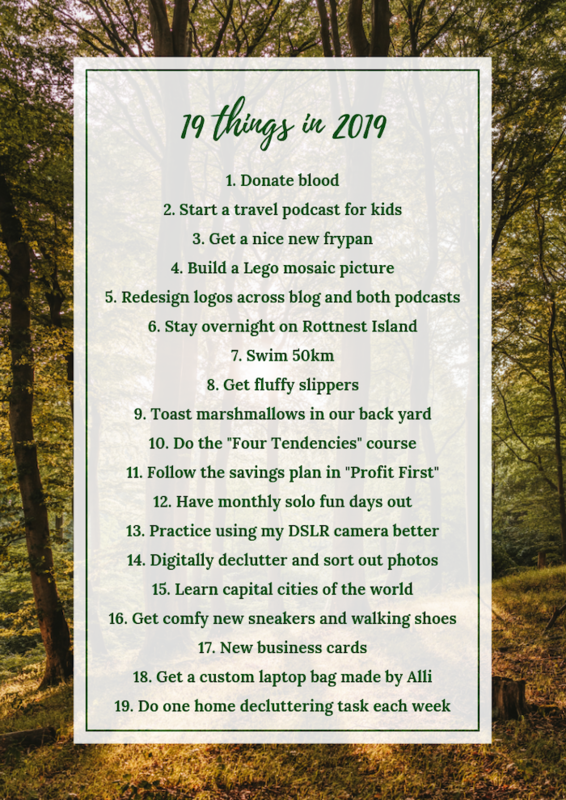 I had lots of fun with my list of 18 tasks for 2018 and it seems only natural to me that I will repeat the process for 2019 – for me, it’s an important way of introducing some balance into my life and also to keep a few key tasks literally in front of me throughout the year – this list will be stuck on the side of my fridge, the same as the last one. 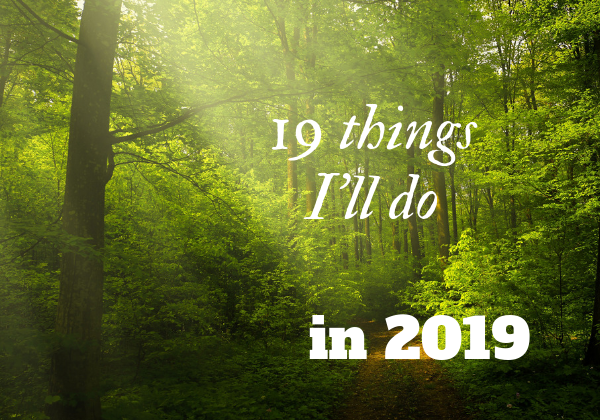 I wasn’t 100% successful with my 2018 tasks, but have learnt a few lessons from that, and if you compare my lists you might see more “one off” tasks this time round, rather than stuff I want to commit to constantly throughout the year (though there are a couple of those, still, because they’re important). Without further ado: here’s my list. My mother is a champion blood donor and I have long meant to do this, too. In the past I’ve had heaps of problems with medical staff even being able to get enough blood out of me for a blood test (I remember as a teenager my GP told me, searching for a vein, that I would never be a drug addict! ), and have therefore thought I might be a bad blood donor, but I’ve never even tried – so in 2019, I will try! I’ve been thinking about creating a children’s podcast for most of 2018, have lots of ideas for it, and even narrowly missed out on getting it funded by a big Google project (apparently, my idea made it to the top 5% of thousands of entries – so I’m taking that as a positive that my concept is a great idea!). My plan is to launch on 25th March, which is the third anniversary of The Thoughtful Travel Podcast. It’ll be about travel, culture and geography, aimed at kids between 6 and 12, and it will be FUN! I want a “healthy” frypan. You know, like without toxic nonstick coating. Not quite sure about the one I mostly use now. Anyway. It’s on the list! Because my son and I go to see any Lego-related thing ever, I’ve seen some awesome mosaic pictures made out of Lego, and I want one for my wall! (Not a picture of me, though, which is possible!) I imagine I’d like to create one based on a photo from my travels but then which photo would I choose?! I will have to try and narrow it down. Not just logos but a bit of everything to get some consistent branding and design across NotABallerina.com, The Thoughtful Travel Podcast and the yet-to-be-titled kids’ travel podcast. This was on last year’s list and sadly ended up incomplete (I blame trips to Japan, Fiji, Thailand, Vietnam and Cambodia for that … it was an unexpectedly busy travel year!). But good ol’ Rottnest Island, just off the coast of Perth, is a very special kind of paradise, and I haven’t stayed overnight there since my son was born – so I’ve promised him we will, soon. 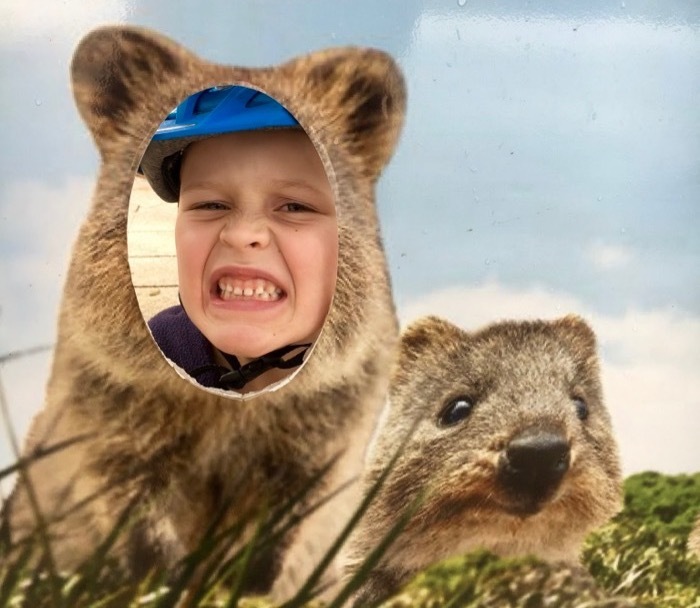 Last trip to Rottnest – just a day trip – with my son being a slightly scary quokka! Another victim of last year’s list – I failed to get back into a proper lap swimming routine but I miss it and know how good it makes me feel so I want this to stay on the list! 50km is less than one swim per week (I usually swim at least a kilometre, if not more) so I know it’s feasible if I make it a higher priority. Following on from the fabulous success of last year’s “get a comfy dressing gown” I am excited to do this when winter hits! Our new (to us) house came with a little fire pit in the back yard and I have always told my son it’s the perfect place to toast marshmallows. I have very sentimental memories of doing this with friends as a teenager and I will see if I can recreate that feeling with my son! As an early Christmas present to myself, I bought Gretchen Rubin’s online course about the four tendencies (a theory she created that I’m quite obsessed with, and that I often use as part of my work, too). Like many of us I’m not always good at following through and finishing an online course but this one I’m doing as a treat to myself and I will finish it! I read Mike Michalowicz’s Profit First a few months back on the recommendation of some of my peer mastermind members (and also because I’d seen Mike speak at a conference several years ago, and liked his thought processes) and I would love to implement more of what he talks about. Very simplified, he advocates taking a percentage out of every bit of income your business gets and putting it in a kind of untouchable profit account (profit first! ), something I’ve never done; I do have a separate account for tax/GST which has made sure I always have that ready to pay but the profit idea I like. And there’s more to his system, and it makes good sense to me. This was on last year’s list … and I failed to prioritise it. That’s bad because I know how important it is to have times that are NOT about work, no matter how much I love my work! I will make a much bigger effort to schedule and protect those days in 2019. I did learn more about using it well in 2018, as promised, but what I also realised is learning isn’t enough – practice is the key! I’ll take some time to really keep practising and making my photos better! Something else from last year’s list which I failed to do (because: boring!) but it’s very important. I need to, at the very least, sort out all my photos, and also to clear up my current laptop’s hard drive, before it becomes a problem. It’s five years old I think? and is still perfect – but I know that eventually just keeping every file including thousands I don’t need is going to come back to bite me. 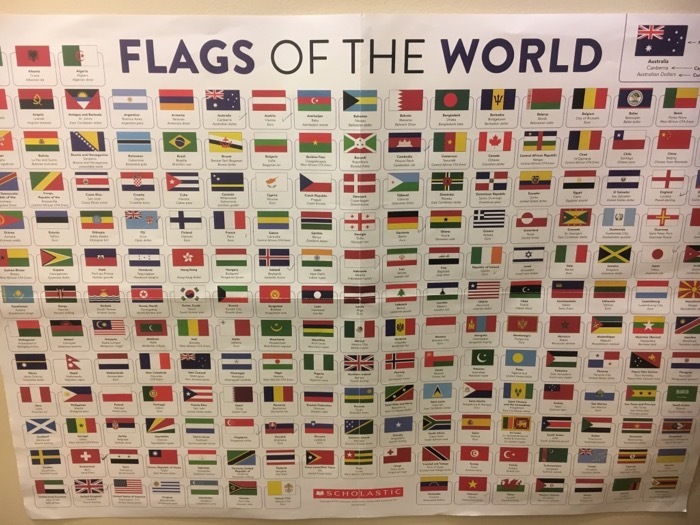 My son and I have already started this, inspired by a new poster of flags we have hanging up in our toilet! Both of us also spend a lot of time staring at the world map hanging in my bedroom, and we will often quiz each other about world facts. There’s no special reason to need to know the world’s capital cities but I figure it’s fun, interesting and probably good for my brain! Did you know the capital of Belize is Belmopan? I do!! Recently I noticed that both my sneakers and my walking/hiking shoes are starting to fall apart. I was briefly annoyed until I realised that both pairs have been with me since my son started kindergarten … and he’s in Year 4 this coming year. I do a lot of walking so it’s hardly surprising, and well and truly time for more. I am running low on business cards (which I still use surprisingly often) and once I have new logos and stuff, I need to get these made! One of my clients, the simply delightful Alli of Loulou and Mo, makes incredible high-quality bags of various kinds, including laptop bags, and I want to gift myself one that really suits me. I have a very practical brown one but I’ve been using it for some years now and I really want something more “me”. Being tidy is not my greatest skill. But as Gretchen Rubin often says, “outer order, inner calm” and reluctantly I know that she’s right. I’ve been living in my current home for two and a half years and still have boxes I haven’t unpacked from that move; I also have a tendency to keep stuff I definitely don’t need to keep. 2019 is the year I will consistently work on this! Another great list, Amanda. It feel very companionable to know that you and others are writing lists of things to do. Even better is sharing them publicly. Thanks Maureen! Yes, sharing publicly leads to all kinds of nice stuff happening (like I got invited to a wonderful Thanksgiving dinner last year because celebrating it was one of the things on my list).